Reducing global dependence on carbon fuels has never been more crucial to sustaining the planet. Anatoli Chkrebtii, PhD, Professor of Physics and Graduate Program Director of Materials Science in the Faculty of Science, is devoted to collaborative, international research to create highly efficient and price-competitive solar cells, as well as improve performance of microelectronic devices. He is examining cost-efficient nanomaterials to enhance the property and efficiency of solar cells to produce green energy. His research focuses on the simulation of structural, dynamic, electron and optical properties of semiconductor surfaces and interfaces, such as Silicon, in particular Si(100) – the cornerstone of modern electronics, confined systems and nanomaterials toward their device application, including solar cells. Dr. Chkrebtii also aims to improve the properties of high-quality materials for microelectronics including functionalized graphene, the thinnest, yet strongest form of carbon. By understanding the nature of these nanomaterials, his research may lead to applications for biotechnology in the healthcare industry, as well as supercapacitors for batteries and microelectronics to increase power across many industries from technology to transportation. 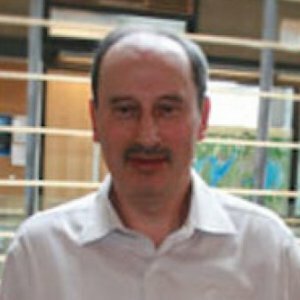 He has spent over three decades pushing the boundaries of novel materials, as a Senior Scientific Researcher with the Institute of Semiconductor Physics of the Academy of Sciences of Ukraine, a Visiting Professor in both the Department of Physics at the University of Rome and the Institute of Solid State Physics at the Technical University of Berlin, Germany. In 1996, he moved to Canada as a post-doctoral fellow of nonlinear quantum optics at the University of Toronto, where he was later named a Research Associate. In 2003, he joined UOIT as an Associate Professor and was appointed Materials Science Graduate Program Director, a program he co-developed. Many theoretical problems have been resolved by his fundamental research with a view towards industrial applications. His authored and co-authored works have appeared in more than 120 highly ranked publications and four monograph chapters as A.I. Shkrebtii. He received his Doctorate from the Institute of Semiconductor Physics, and his Master of Science in Theoretical Physics (Honours) and Diploma in Theoretical Solid State Physics from the Department of Physics at Kiev State University, both in the former USSR. Dr. Chkrebtii has authored and co-authored more than 120 highly ranked publications and four product monographs. His work is published as A.I. Shkrebtii. As principal investigator, Dr. Chkrebtii aims to develop cost-efficient solar cells for terrestrial applications with substantially higher efficiency as compared to the existing photovoltaics systems. The research combines both photovoltaic materials simulations and solar cell device modelling with experimental investigations. As co-investigator, Dr. Chkrebtii's research project is devoted to the development and implementation of comprehensive theoretical formalism to maximize the photoconversion efficiency of the solar cell systems by optimizing physical parameters of the device. As principal investigator of this six-year project, Dr. Chkrebtii aimed to build the theoretical formalisms and its numerical implementation to allow efficient non-invasive in situ experimental optical and vibrational characterisations of the modern semiconductor materials for microelectronics and photovoltaics. This research presents a theoretical study of the optical spin injection, optical current injection, and second harmonic generation of two 50% hydrogenated graphene structures: optical spin injection, under the incidence of circularly polarized light onto nonmagnetic semiconductors, creates spin-polarized electrons in the conduction bands. Optical current injection and second-harmonic generation are nonlinear second-order effects that are allowed in materials without inversion symmetry. Conversion of energy of beta-particles into electric energy in a p-n junction based on direct-bandgap semiconductors, such as GaAs, is analyzed considering realistic semiconductor system parameters. An expression for the collection coefficient, Q, of the electron–hole pairs generated by beta-electrons is derived taking into account the existence of the dead layer. The conversion of energy of electrons produced by a radioactive β -source into electricity in a Si and SiC p–np–n junctions is modeled. The features of the generation function that describes the electron–hole pair production by an electron flux and the emergence of a “dead layer” are discussed. Hydrogen (H), introduced into crystalline (c-) or amorphous (a-) silicon (Si), is important for modifying Si properties, required for solar cell (SC) photovoltaics. To establish correlation of microscopic H bonding and distribution with the macroscopic properties of Si materials, and to theoretically interpret experimental spectra (from, e.g., non-destructive infrared or optical techniques) we carried out finite temperature ab-initio molecular dynamics (AIMD) for both c-Si and a-Si:H.
To accurately calculate efficiencies η of experimentally produced multijunction solar cells (MJSCs) and optimize their parameters, we offer semi-analytical photoconversion formalism that incorporates radiative recombination, Shockley-Read-Hall (SRH) recombination, surface recombination at the front and back surfaces of the cells, recombination in the space charge region (SCR) and the recombination at the heterojunction boundaries. Selfconsistent balance between the MJSC temperature and efficiency was imposed by jointly solving the equations for the photocurrent, photovoltage, and heat balance. Finally, we incorporate into the formalism the effect of additional photocurrent decrease with an increase of subcell number. The thermal stability, evolution and structure of the bond-centered-hydrogen (BCH) defect in crystalline silicon, its temperature induced dissociation, and the new H complexes formed have been studied in the temperature range from 50 K to 650 K by first-principles molecular dynamics (MD). We demonstrate that BCH is stable at 60 K, but decays at and above 310 K in agreement with experimental results. Demand on high quality amorphous hydrogenated Si (a- Si:H) for thin film solar cell or microelectronics applications necessitates microscopic and in-situ access to various processes in this fundamentally interesting material. We demonstrate that such access can be provided by combining first principles computational simulations with commonly used infrared vibrational spectroscopy and still rarely utilized optical ellipsometry in the infrared (IR) range. To achieve this goal we developed computational approaches to comprehensively track hydrogen behaviour in both ordered and disordered (non-crystalline) materials. A novel, efficient method for calculating the temperature dependencies of the linear dielectric functions of semiconductor systems and its application are presented. The method follows an intuitive and natural path with ab-initio finite temperature molecular dynamics providing the thermally perturbed atomic configurations, which are used as structural inputs for calculating the dielectric function. The effect of lattice dynamics, including quantum zero point vibration, on the electronic bands and dielectric function of crystalline (c-) GaAs and Si as well as hydrogenated amorphous Si (a-Si:H) is discussed.